The Sumatran elephant (Elephas maximus sumatranus) is one of the three recognised subspecies of Asian elephant (the other two are the Sri Lankan and Indian elephants). The Borneo elephant is believed to be a fourth subspecies. The Sumatran elephant is the rarest of the three subspecies, being classified as critically endangered. The arrival of the Dutch in Sumatra resulted in the majority of the Sumatran elephant population being killed, for ivory, and for sport. The Dutch government belatedly protected the animals in 1931. Today the wild population of Sumatran elephants is believed to be around 2500 individuals. The Sumatran elephant is considered to be the most distinct of all the Asian elephant subspecies. In particular, it has 20 pairs of ribs, compared with 19 for other subspecies (African elephants have 21 pairs). They are the smallest elephant subspecies, but have larger ears and longer tusks than other Asian elephants. They weigh around 5,000kg, and stand up to 3 metres tall. They can successfully breed with other subspecies, and in the 1980s imported Thai elephants bred with captive Sumatran elephants. The Sumatran elephant's habitat consists of lowland rainforest, a habitat which on Sumatra has been largely destroyed over the last 3 decades, in order to plant oil palm. There are approximately 25 discrete (fragmented) populations of elephant spread across the whole island of Sumatra, from north to south. Several populations exist in the Gunung Leuser National Park, in Aceh and Langkat (in the jungle near Bukit Lawang), North Sumatra, which is protected rainforest. There are also populations in Tesso Nilo national park, Riau, Kerinci Seblat, southwestern Sumatra, Way Kambas and Bukit Barisan Selatan national parks, in southern Sumatra and Bukit Tigapuluh national park in central Sumatra. The Sumatran elephant's diet consists of leaves, grass, bark and twigs, from numerous different species. Fruit is not a significant part of their diet. Elephants spend nearly all of the day feeding, due to their size, although slightly less time than larger mainland subspecies. The daily calorie requirement is around 50,000 calories. Individuals range over around 100 square kilometres, a smaller area than Indian or African elephants, which may have to search for water and food during dry seasons, a problem not faced in Sumatra, which has rain twelve months a year. Elephants reach sexual maturity around 12 years of age and give birth to single calves after approximately 18 months of pregnancy. The newborn infant will suckle on its mother for around for years. Due to competitive male mating behaviour, younger bull elephants are usually not able to mate. Unlike African elephants, female Asian elephants generally do not have tusks. Every year dozens of wild Sumatran elephants are illegally killed, typically by poisoning. This usually occurs where elephants disturb illegal plantations, although in some cases the motive may simply be to cut off their tusks, for ivory. Wild Sumatran elephants can sometimes be seen in the jungle on multi-day treks from Bukit Lawang. Captive elephants at CRU Tangkahan. Wild elephants are very large animals, which will inevitably come into conflict with humans in areas of shared habitat. Due to the threat to human life that the elephants pose, problem elephants were likely to be killed. The Indonesian government developed a response to this in the 1980s, which was to capture wild elephants in conflict areas and bring them to elephant training centres.Captured elephants were trained for riding, and some also to work in production forests (for logging). Hundreds of elephants were captured between 1986 and 1999, when the capture program ended (although some wild elephants have since been captured in parts of Sumatra), as the elephants did not generate income for the government, and indeed were expensive to care for and feed. A single captive elephant requires around seven hectares of land, and in many cases the initially protected areas has been reduced in size by plantations and/or logging. The first elephant training centre, and still the largest, is the Way Kambas Elephant training centre in the far south of Sumatra, which was established in 1985, and aimed to capture all of the wild elephants in the area. Training programmes began with assistance from both Thai mahoots and two trained elephants from Thailand. The system of training starts with a trained elephant, which walks in front, while tied to a wild elephant behind it. Initial work training elephants for logging work proved not to be worthwhile, as there was no demand to employ Sumatran elephants in logging concessions, as they are expensive to feed and care for, and weaker than other Asian elephant species. 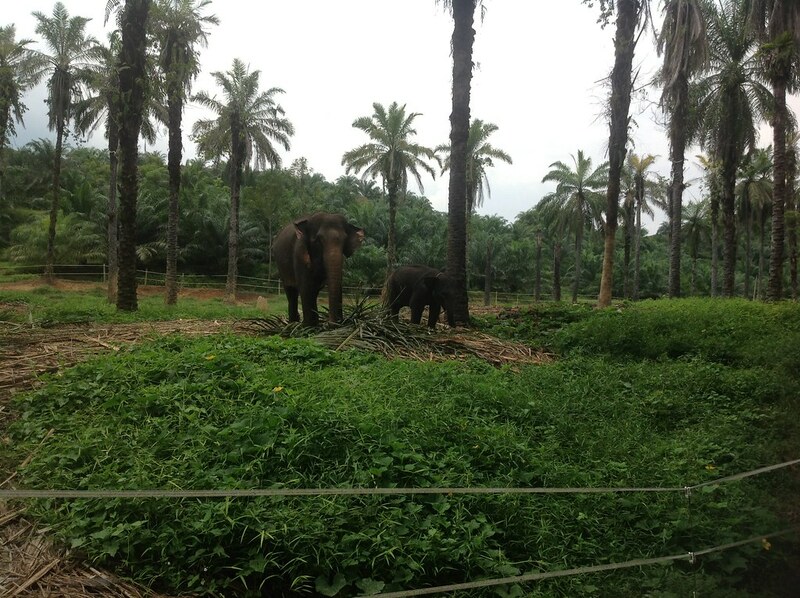 Elephants from the training centre were sent to Java and Bali to work in tourist parks and zoos. Another centre was established at Duri, Riau province in 1988, originally on 5000 hectares of land. The elephants here were captured in Riau as well as in Jambi province. Another centre nearby, which is now larger, is at Minas. Lhokseumawe, in Aceh was also established as a training centre in the late 1980s. However, in around 1999/2000, two mahoots were killed, presumably by Acehnese separatists, and the site was closed down, and the elephants sent to Aras Napal (below), and to Saree, Aceh. In 1990, the Holiday Resort Aek Raso were established on 4964 hectares of secondary forest at Kota Pinang, Labuhan Batu, North Sumatra, close to the border with Riau province, and a little more than half way between Medan and Pekanbaru, off the main trans-Sumatran highway. Elephants arrived in 1994 to establish an elephant training centre. By 2013 just 30 hectares of land remained, the rest having been illegally planted with rubber and oil palm, and the viability of the project, with 18 elephants, was in question. In 1994, the Saree elephant training centre was established, in northern Aceh. It is the main elephant training centre in northern Sumatra. In 1998, five elephants from Way Kambas were sent to Aras Napal, 242 hectares of land previously designated as a mining concession near Bukit Mas village in the Gunung Leuser national park buffer zone, in the Besitang district of Langkat regency, north Sumatra, around 60km north-east of Bukit Lawang. Road access is typically via the main Medan - Binjai - Banda Aceh coastal road. The elephants centre here is not designated a training centre, but rather as 'Elephant Patrol Unit'. Other elephant training centres in Sumatra are at Seblat, 150km from Bengkulu in south-est Sumatra, established in 1995 on 6900 hectares (in 2014 the government was planning to convert much of the land to oil palm plantation), and at Padang Sugihan in South Sumatra. Overall the captive elephant programme in Sumatra has declined in scope since 2000, with fewer elephants in captivity, and many of the centres themselves threatened by logging and habitat destruction. Some centres have struggled with medical care or funding, and with training programmes, with untamed elephants a risk to neighbouring human settlements. The elephants are often regarded as primarily an economic asset (which in law belong to the Indonesian government) rather than an animal with rights, and protocols may not meet Western standards, however with wild elephant populations unsustainable without large (250 square kilometre and above) undisturbed areas of land, a life in captivity may be the only alternative to death for elephants in conflict with humans. In 2001, an ecotourism site, Tangkahan, was established in Namo Sialang, Batang Serangan, Langkat, around 40km north-east of Bukit Lawang. Following the earliest 'Elephant Training Centre', and Aras Napal's 'Elephant Patrol Unit', the new site was designated 'Conservation Response Unit', with elephants transferred from Saree, Aceh to setup the CRU in 2002, with the assistance of Fauna & Flora International. A CRU uses captive elephants to patrol the jungle in search of illegal activities. In addition, the CRU captive elephants may be used to drive wild elephants away from populated areas, reducing the risk of human death due to wild elephant stampede. From 2004, the Tangkahan CRU switched the focus of its activities from patrolling the jungle to ecotourism, with elephants working six days a week with tourists, and one day on jungle patrol. Subsequently FFI funding was withdrawn, in 2010, and the site is now self-funding, entirely from tourist income. CRUs have since been established at Kerinci Seblat (from 2004, and linked to the existing elephant training centre at Kerinci Seblat), in Trumon (from 2012), on the south west coast of Aceh, Cot Girek, near Lhoksemauwe, Aceh, and Leutung, Mane, in Pidie regency of Aceh. Two CRUs were also established in Bungur, and Tegal Yoso, Way Kambas. Unlike Tangkahan, these CRUs are not focused on tourism, but rather on jungle patrol and human-elephant conflict avoidance.